View from the Birdhouse: Dear Abby - When Are You Ready to Adopt a Dog Again? 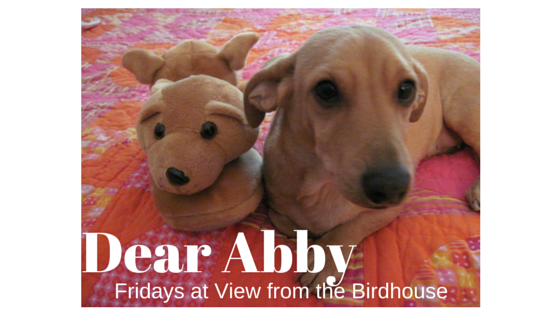 Dear Abby - When Are You Ready to Adopt a Dog Again? 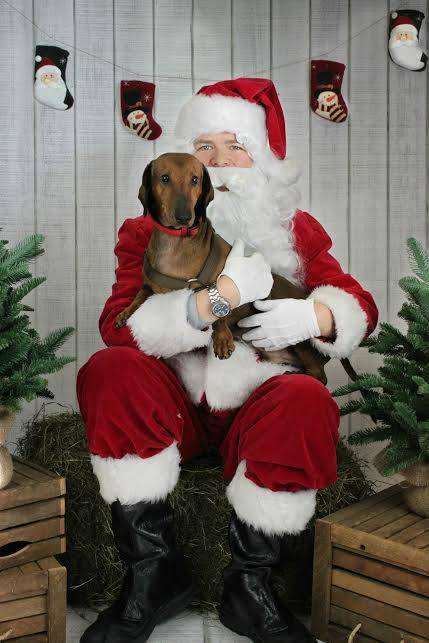 I have a wonderful question from my friend Barbara, who is owned by my dachshund buddy, Oz. She asked how long one should wait before rescuing a new dog friend after a beloved furbaby passes on. Barbara sent along a few photos of Oz, above and below. 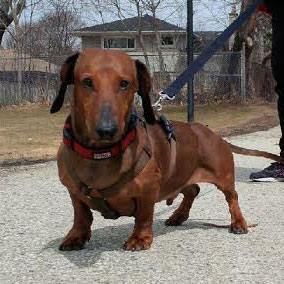 Oz is such a handsome doxie! This is a great question! I do not think there is any time frame. If you feel ready to adopt a new fur-friend, then you absolutely should. I am a believer, as my Momma is, that there is a thread of love with pet adoptions. You loved your pup who passed on, and you know what wonderful companionship you and your pup found together, so you want to share love again with another pup. So the love from one dog carries on to the next, and it is good. I know that people can sometimes offer lots of opinions about this, just as they do with other pet issues. But these choices are up to the pet-person to make, in the best interest of their family and the pets. And as I see it, how can it ever be a bad thing to share a loving home with a dog who needs rescue? We have thought about this a lot here. Momma is not ready yet to adopt a new friend after my beloved brother Barney Fife passed on last year. There will be a time, and there will be a dog who needs a rescue ... maybe a stray, or a dog who needs to be rehomed, or a dog at an animal shelter. That time hasn't arrived yet, but we will know when it is right. And that will be good too. I hope my answer was helpful ... and Barbara, I am so happy that you adopted Oz, who is so blessed to have your family! This is the last question that I have for my Friday blog posts, so I am looking for new blog questions to answer. They can be about dogs, pet issues, or just for fun questions. Any are welcome! Please leave any questions in the comments section below. Awe. Such a cute dog! I think that's a great answer because everyone is different. Hi Abby, I am Jax and I own Diane, your Mom's cousin. Your blog is so true this week. My Mom thinks she picked me, but I really picked her. I came from the Humane Society and when she saw me in that cage with my sad face on she knew I was the one for her. I was left there because my former owners were getting a new baby and they didn't have time for me anymore. I still don't understand what I did wrong, but in the end everything worked out for the best. I am so happy with Diane and she loves me so much. I get treats and she makes me the best dinners EVER! She had lost her beloved dog Taylor a few months before and she had a empty space in her heart that she needed to fill. And I have tried my best to fill it with love. Thank you Abby for listening! Great post! We have been thinking about getting another pup and I think out dog would really enjoy having a playmate! It's really just a question of whether or not we can handle it with out busy schedules. Great post :) Sometimes I think a dog comes along and "finds you" too. 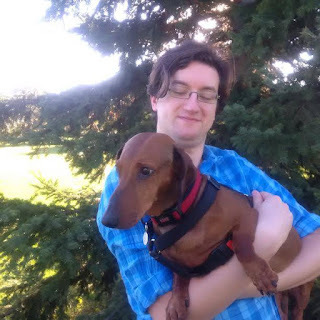 What a cute dog! I definitely think it just come down to when you're ready for another dog. Some people probably need more time to grieve, while others will feel better when they have another pup filling that hole! Thank you all so much for visiting! Jax, I am delighted to hear from a cousin dog! I loved reading your rescue story -- you found a great home! Alexandra, I like what you wrote about a dog coming along and finding you. I agree with that too! Have a wonderful weekend! Love to all! Thank you for such a thoughtful & gentle response to such a sensitive matter. And thank you for sharing the photos of our Oz. Our dog Billy had been sick for such a long time, but just the same his passing seemed somewhat sudden. Our hearts were broken. 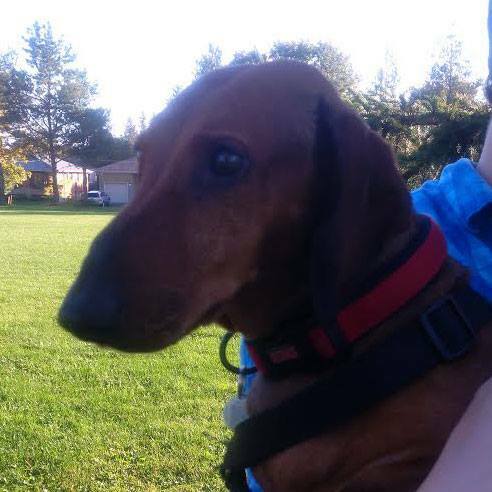 When we were sharing our sad news with those close to us, we learned that Oz needed a family to call his own. He was 7.5 years old & was well cared for, but he was not with a forever family. We were exactly the family he needed. We decided to bring him home 3 days later. I was shocked & saddened by the hurtful comments from people we called friends. "How can you replace Billy so fast?" & "What about all the money you just spent?". At 7.5, Oz didn't need to wait any longer for a family & we were in fact a perfect match. I still grieve for Billy almost 2 years later. But I love Oz with all my heart & have absolutely no regrets about the timing. Each family dog has brought his unique personality to our family and Oz was certainly meant to come to us at the time he did. Barbara, thank you for your question and your comment! I agree that Oz was meant for your family, and he is a perfect match for y'all! Thank you for sharing his story and photos here.